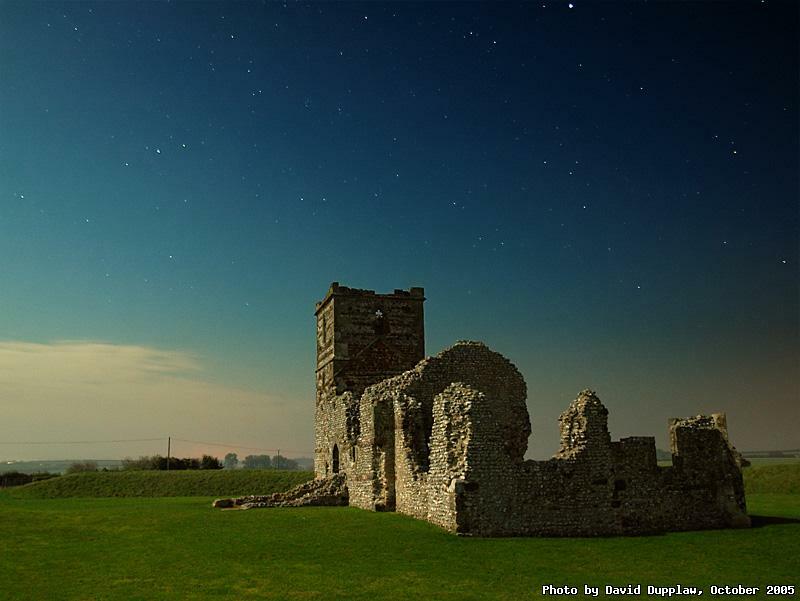 Knowlton Church is a unique 14th Century church that is built in the centre of an earlier pagan earthworks. It stands out in the countryside in Dorset although once upon a time it was the centre of a busy market town of which there is now no evidence. The town was wiped out in the plague and although the church continued to be used it was ruined when a roof repair failed. This photo is lit by moonlight from a three-quarter moon. For those astronomers (or astrologers) out there, you can see Aquila the eagle on the left (starting from the three stars forming a band, the brightest of which is called Altair) and to the right, the mighty constellation of Hercules. The bright star at the top is Vega of Lyra.